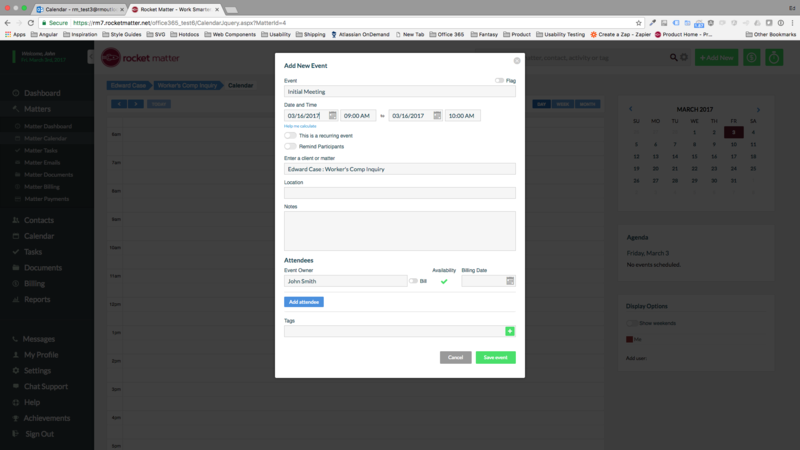 The cloud practice management platform Rocket Matter today is announcing a deep integration with Microsoft Office 365, enabling two-way Outlook calendar and contact synchronization and the ability to save emails and Word, PowerPoint and Excel documents directly into Rocket Matter. 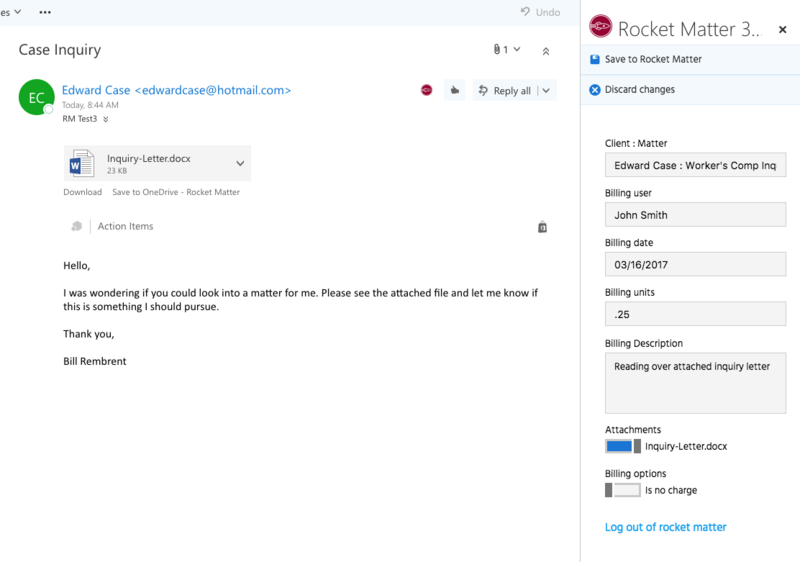 Rocket Matter previously integrated with Outlook through an add-in, but this new integration is easier to set up, more robust in its functioning, and extends the integration to Office documents. In addition, while the add-in worked only in Windows, this new integration is cloud based and therefore works on PCs, Macs, Chromebooks and smartphones. Rocket Matter also announced three other new features today: the ability to add interest or discounts to client invoices. 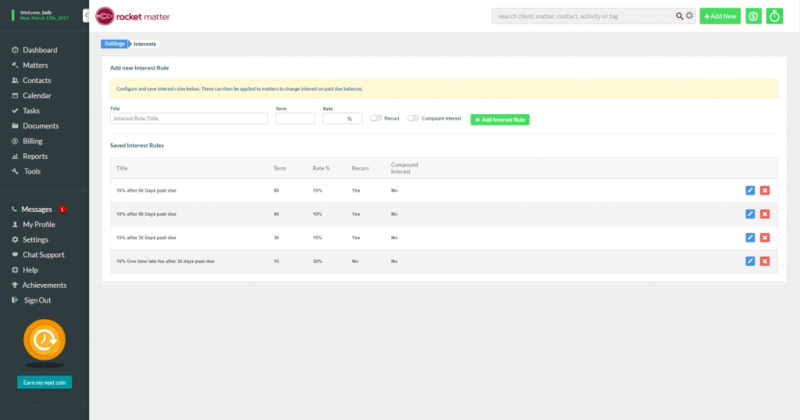 the ability to set convenience fees as an alternative to billing for expenses, and a more robust conflicts checker than was previously available. Yesterday, Port and Ed Case, Rocket Matter’s product manager, gave me a tour of the Office 365 integration, starting with the calendar and contact syncing. Enabling this synchronization is done through two toggle switches, one for calendar and one for contacts. When a new event is added in Rocket Matter, it also appears in Outlook. Once enabled, any changes you make to your calendar or contacts are synchronized. Synchronization is two way, so changes made in Rocket Matter appear in Outlook and changes made in Outlook appear in Rocket Matter. The changes appear instantaneously — there is no need to wait for the synchronization to occur. The integration allows you to to keep track of your calendar events from inside your matters. Also, calendar appointments can be sent automatically to your invoices for billing. Save emails from Outlook to matters in Rocket Matter and add billing information. The email integration allows you to upload your emails from Outlook on a Mac or PC directly into a matter. A side panel within Outlook lets you designate the matter, add billable time for the email and, if you choose, import your attachments as well. This works only for emails you are reading, not for emails you are drafting, so you cannot draft an email and automatically send it to Rocket Matter. Instead, you have to send it, then open the sent message and save it to Rocket Matter. Upload a document to Rocket Matter from within Word. 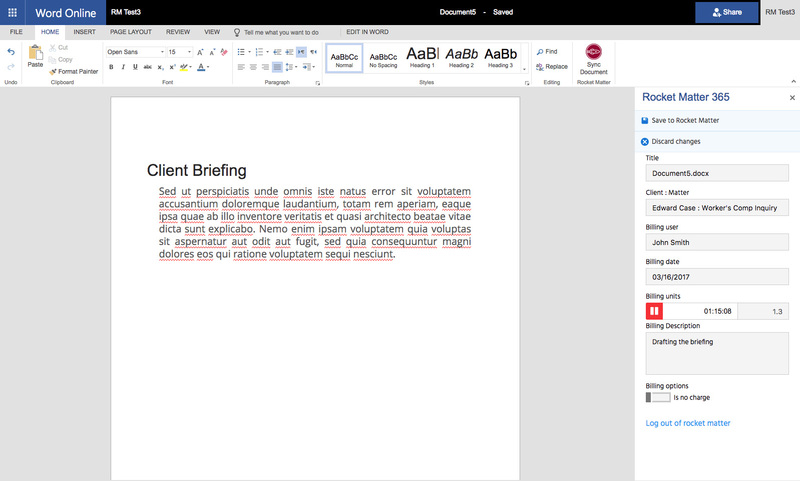 The final aspect of the integration adds the ability to upload documents directly to Rocket Matter from within Word, Excel and PowerPoint. You can also bill for the time you work on your files. Rocket Matter has also added full document versioning, so that any documents uploaded from Office are versioned. Rocket Matter now tracks document versions. As mentioned, Rocket Matter is also announcing three other new features today. Create rules for applying interest. Interest and discounts. 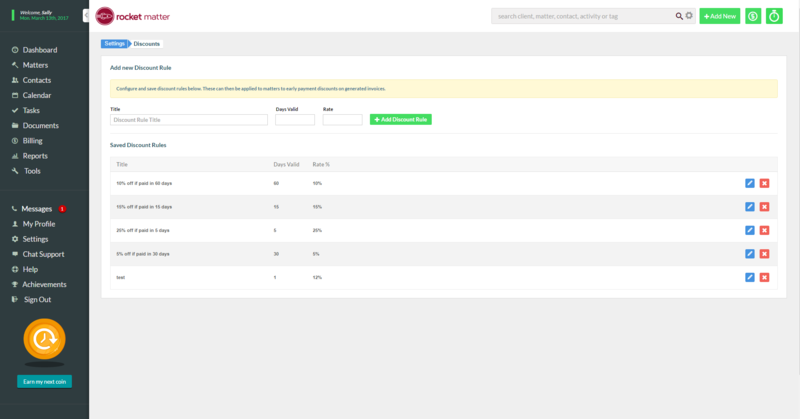 Users can now set up rules within Rocket Matter for applying interest or discounts to client invoices. Port calls this a carrot-and-stick feature, in that discounts for prompt payment encourage clients to pay their bills in a timely way, while interest penalizes them for late payments. Users can create multiple rules. For interest, set the term and rate, and indicate whether to apply compound interest. For discounts, set the number of days the discount will be valid and the discount rate. Use discounts to encourage prompt payments. Convenience fee. Some firms choose not to track expenses and instead charge a convenience fee as a percentage of the total bill. The option added today lets firms set rules for applying convenience fees. Rocket Matter now has more robust conflict checking. Conflict checking. Although Rocket Matter previously had the ability to check for conflicts through searches, today’s rollout adds a more robust conflict-checking capability. 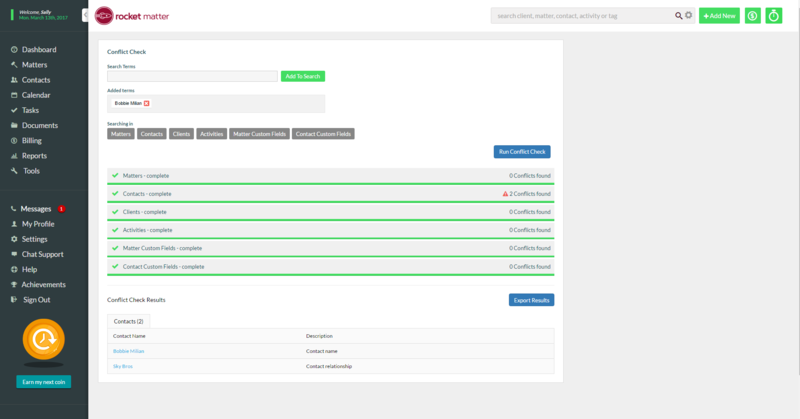 It allows users to add multiple search terms and choose the areas within Rocket Matter to search or not search (contacts, matters, activities, etc.). Results show any conflicts found and the areas in which they were found. The search can be exported and saved as a record.